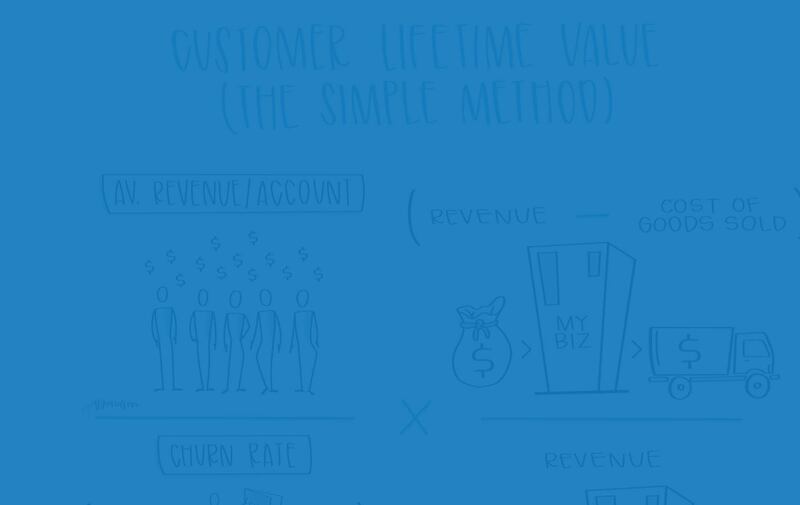 What is Customer Lifetime Value? How is it Calculated? We’re diving into a can of worms here, so stay with us, because understanding customer lifetime value will significantly help you make better decisions when it comes to customer acquisition costs. 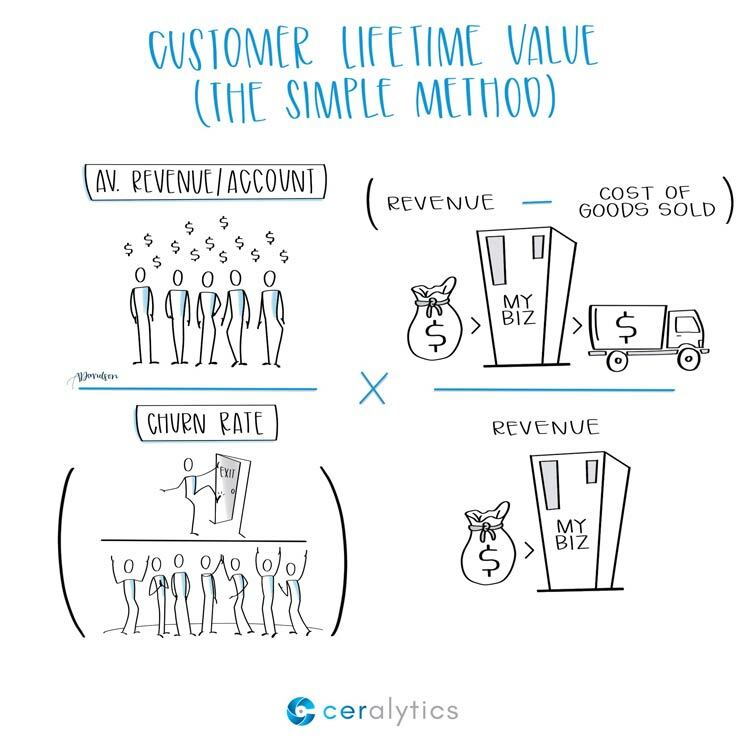 Before we get into the math, let’s get into why the math of calculating customer lifetime value (CLTV) is so important. If you’re running a business, you have costs to acquire new customers. Those costs probably include all of your marketing and sales efforts. So, if you spend $100 to gain one new client, you’d logically think that you’d need to get more than $100 in profit from that client in a year to run a successful business. Right? But what if that client spends $100 every year for 5 years? Would you now be willing to spend a little more money to acquire that client in the first place? While the equation above looks a little hairy, it breaks down pretty easily. First, calculate the average revenue you receive from your clients in a given time period. For example, assume that last year your company made $1,000,000 in revenue from 1,000 accounts. The average revenue per account would then be $1,000. Next, calculate the churn rate, which is simply what percentage of clients that leave your company over that same period of time. Let’s assume that you lose 20% of your clients each year. Your churn rate is then 20%. Some people stop here, thinking they’ve done the work they need. But this is just calculating how much revenue they’ve received from each client – not the actual value in profit from the client. So we need to take this $5,000 times the profit margin on each client, which is simply the revenue – expenses divided by the revenue for each client on average. Again, if the revenue from each client is $1,000 and expenses to deliver our products to that client are $500, then the profit margin will be ([1,000 – 500]/1,000) or 50%. Now, we take the $5,000 we got from the left-hand side of the equation and multiply it by our margin of 50%, and we get a CLTV of $2,500. For each customer we bring on, we make an average of $2,500 over the life of that client relationship. We now know that our CLTV is $2,500. So how much would we be willing to pay in marketing and sales to get more clients? Obviously we want to stay below that number, or our costs to acquire clients will be more than the revenue we make back from them over their lifetime. But we could definitely consider spending more than $1,000 to get that client, since we’re looking to make $2,500 during the life of that client relationship. We’ve all heard that keeping a customer is a lot easier than making a new one. Here’s proof. If you do the math above with a slightly better churn rate, you’ll notice that the profit you get for a client goes up significantly. If our example had a 10% churn rate instead of 20%, the CLTV would end up being $5,000 instead of $2,500. A reduction of 10% in churn rate DOUBLES the profitability of a client in that example. So what’s easier, keeping 10% of your clients or doubling the number of new clients? Both would get you the same revenue in this example. Look at your own business. Do you know the customer lifetime value of your customer base? Do you know your current client acquisition costs? It might be helpful to do some back of the napkin math to see if you’re justified in spending more or less to acquire future customers.